Sitting at his home in Oklahoma City, J.T. Realmuto was waiting by his phone with his bags packed waiting on a destination. Then the call came on Thursday afternoon that he was heading to Philadelphia. "My wife and I already had the truck packed up and ready to go, we just didn't know if we were driving to Arizona, Jupiter, or Clearwater," Realmuto said with a laugh. "When we got the call we left that night." The All-Star catcher arrived in Clearwater on Friday afternoon and was with the club on Tuesday as pitchers and catchers opened up camp. The first official workout is Wednesday. "In acquiring J.T. Realmuto we believe we acquired the best catcher in baseball," said Phillies general manager Matt Klentak. "That makes everybody in this organization excited. From top to bottom, we are just thrilled to add J.T. to our club." The stats back up Klentak's claim. An All-Star last year, Realmuto hit .277 with 30 doubles, 21 homers, 74 RBIs and a .825 OPS for the Marlins last season. 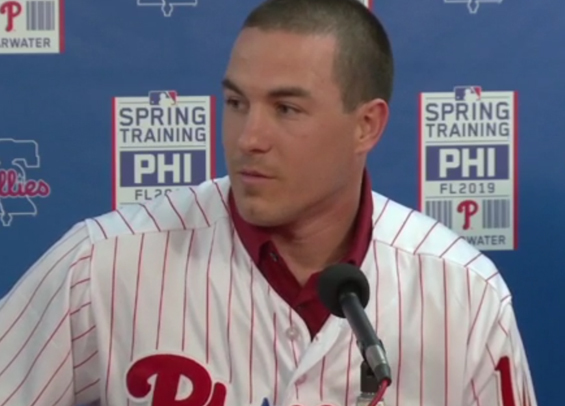 He'll turn 28 in March and profiles as a potent bat anywhere in the top portion of the Phillies' lineup. Beyond his offense, Klentak and others believe his skill behind the plate and in calling a game will enhance the pitching staff, particularly helping young arms like Nick Pivetta and Zach Eflin take the next step in their maturity as developing hurlers at the big league level. "There's a lot of great arms on this team, a lot of young guys with electric stuff, guys that are getting better," Realmuto said. "From top to bottom, this entire rotation has quality, plus stuff and they've all gotten better. I look forward to helping them continue their improvement." Klentak made it a point on Tuesday to reemphasize the organization's interest in adding more talent through free agency or a trade, stating the addition of Realmuto doesn't preclude the club from making another big move. Asked about Bryce Harper and his interest in having him potentially join him in Philadelphia as a teammate, Realmuto offered a smile. "Absolutely, anybody would love to have a guy like that on your team," he said. "There's a time and place though for that discussion, and I haven't been involved with those discussions because I haven't been here very long, but I would love to have a player like that on this team."